We invite you to explore India - the Land with infinite beauty ! Whether you soar high into Himalayas or peer under the ruins of the Ancient monuments dotting the landscape of India, you will cherish the experience long after your visit ! This India Travel Guide on Basilica of Lady of Graces Sardhana is free from any commercial interest! This site is dedicated to promote India - the vast subcontinent, its glorious past, magnificent landscape and its infinite variety. 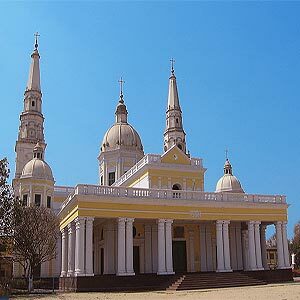 About 20 kms from Meerut is the town of Sardhana which houses the Catholic church of Our Lady of Graces whose lofty spires can be seen from afar. In the heat and dust of the plains of northern India, this marble monument stands like a quiet sanctuary. Sardhana was founded by Walter Reinhardt, a serious-minded Austrian who was nicknamed Le Sombre. This was then changed to Samru in an indianized fashion. He married Farzana, a tawaif who later became Begum Joanna Samru. In 1781, the Begum converted to Catholicism. She wanted to build a church that would be revered for years. This church was built by the Italian architect Anthony Reghelini, a native of Padua. The church was ready around 1825. Brief History: This minor Basilica was inspired by St.Peter's Basilica in Rome. Father Julius Caesar Scotti was appointed as Bishop of the Titular See of Amathunda and Vicar Apostolic of Sardhana by the Pope under the request of Begum Samru in the year 1734. Near the marble church is the 18 feet tall structure over the tomb of the Begum. This edifice was carved by the Italian Sculptor Adamo Tadolini from fine Italian marbles. It depicts her with a scroll from the then Emperor Sha Alam II bestowing upon her the fiefdom of Sardhana. Shown alongside are her adopted son David Dyce Sombre and her diwan Rae Singh who was the great grandfather of Motilal Nehru. This Marian Shrine was presented with a cierge, a beautifully worked candle by Pope John XXIII in 1960. In 1961, it was raised to the level of a minor basilica by Pope John XXIII. Thousands of visitors throng this minor basilica in Sardhana during the month of November. A large amount of earth was dug to build the church leading to the creation of a big artificial lake and another smaller one later. The church gate offers a north-side view of the magnificent building. This is because the altar in the church faces the east, as per Roman Catholic worship. The driveway is lined with flowering hedges and bears 14 stations of the Cross erected alongside. You will also find 20 plaques depicting Mysteries of the Holy Rosary. The huge church has a pillar-lined verandah that runs round it. The 3 domes over the church are built in similar fashion to those in St. Peter's Basilica. You can find traces of Byzantine architecture, especially in the central dome which is capped with black and white marble. Notice the gilded metal balls surmounted with crosses on the domes and spires. At the altar, the exquisite floral design inlaid with semi-precious stones on white marble is a beautiful sight. Towering behind the main altar on a huge marble tabernacle is the statue of Our Lady of Graces. Originally it was enshrined with a beautiful painting of Our Lady of the Sacred Heart which was later moved to the Seminary Chapel in St. John's. You can walk across to the chapel of the Sacred Heart of Jesus. Don't miss the wooden gates that appear like gleaming metal. The other chapel is also richly decorated with marble and houses the famous image of the the Sacred Image of Our Lady of Graces which was enshrined in 1957. The tomb of the Begum is located in the wing to the left of the main altar. Adamo Tadolini of Bologna, Italy was the sculptor of this marble monument built in Carrara marble. It has figurines and panels in bas relief. You can find the statue of the Begum in her finery. Other figurines hold a circular drum bearing inscriptions in Latin, English and Arabic. The Catholic cemetery is located to the right of the church. It is a protected monument under the archaeological department of India. The pyramid shaped tombstones belong to the family of the church architect. The beautiful vault of the Begum's descendants is exquisitely designed. You can find a grave of the Begum's French husband Le Vaisseau. O Fountain of all Grace! Grace! Receive me, Most Holy Mother! may Reign in every heart.